Today was hot and sticky, a midday downpour only fueling the humid mass that enveloped the city in mid-summer lethargy. After sitting in my artificially cooled office all day, though, meticulously comparing spreadsheets, I was eager to get outside. I walked home in the sunny, oppressive air, and felt a layer of sweat quickly bead yet refuse to evaporate. But still, I wanted more, so I changed clothes, filled up my water bottle, and set out on my bike. 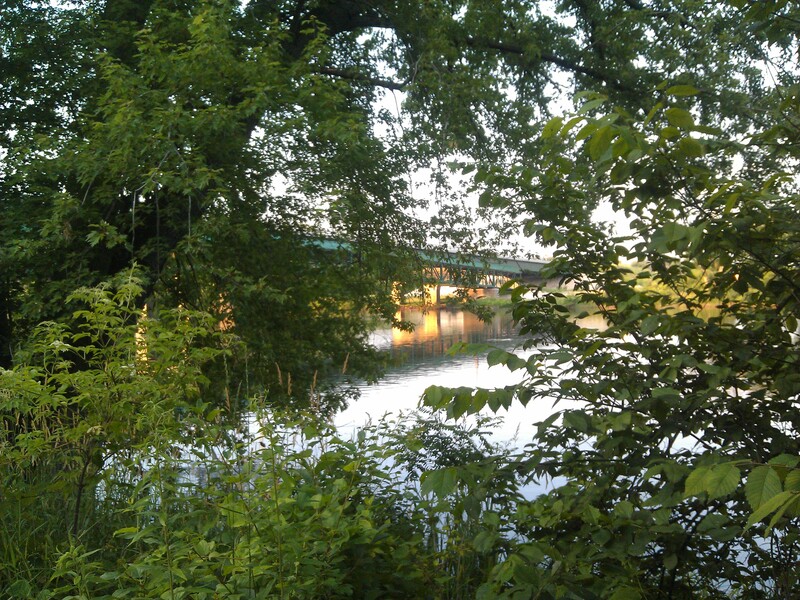 I took the Fox River Trail south, hugging the swiftly-moving river, swollen with recent rains. As soon as I hit the “roller coaster” part, where the tree-lined path races up and down steep hills, I was alone in the woods, biking through clouds of hungry gnats, away from other bikers and runners. 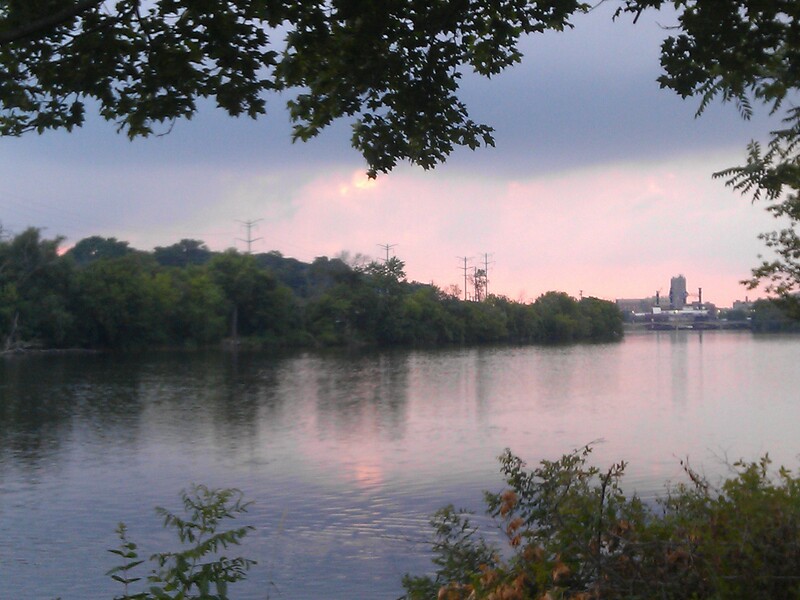 I could smell and hear the river, just a few feet away through the trees, and I kept pedaling south. Beyond the South Elgin dam, headed for Tekakwitha Woods, the path turns even more rural, the thick canopy of trees blocking out light. Down another hill, the pavement ended, splattering mud over my legs and bike. I inhaled the wet leaves and trees, with a hint of algae and fish from the river, and coughed out a bug. Finally I reached the pair of bridges spanning the Fox at Tekakwitha, where we often see herons and egrets. Tonight, the river was moving faster, and I spied a lone great blue heron against a bridge pylon. It stretched its wings in that gangly-yet-graceful way of herons, deciding against flight for the moment. I walked across the second of the bridges, the quiet broken by a quartet of bike tires rattling against the planks. Off to the west, the sun began its descent, and clouds were gathering, so I hopped back on and headed north, slowing to watch for more herons. The clouds and trees blocked more and more light, but I kept my sunglasses on to shield against bugs as I headed home. Only a few people were out, and as I crossed into Elgin proper, a Metra train hurtled across the path, bringing commuters home. I was drenched with sweat, but the sky was pink as sunset fought with the fizzling storm. I pedaled up the National Street hill towards home and a shower, pleased with 11 miles on a summer evening. Sounds like a perfect summer evening Crysta. Thanks for taking us on the ride with you. Great descriptive details, Crysta–I could feel myself there.